Oil and gas rich Turkmenistan is in the grip of a food and economic crisis. Long lines for basic foodstuffs have become the new normal in a country that once boasted free gasoline allowances and, more recently, free utilities. 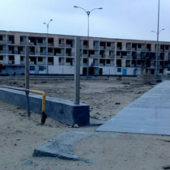 In his travels around the country for Alternative Turkmenistan News, Azat Hatamov has seen project managers scrabbling for scrap metal in a giant dump near Ashgabat and villagers in the fertile Dashoguz region standing in line for scarce flour supplies. In the second reportage on life in Turkmenistan, Hatamov visits the south-east region of Mary. Mary has always been considered the richest region in Turkmenistan, not because the authorities invested billions of dollars of oil and gas money here, as they did in Ashgabat, but because of the people’s inventiveness. When former President Saparmurat Niyazov abruptly banned right-hand drive vehicles, it was the people of Mary who first managed to re-engineer their cars and move the steering wheel to the left. This entrepreneurial spirit has always set the people of Mary apart from the rest of the country. In the mid-1990s, they were the first to sell Turkish and Iranian ice cream, before starting to produce their own. The Mary-based company Salkyn is now the country’s biggest producer. Taze ay, a meatpacking company from Mary, even overtook the processed meats giant Bereketli, which had been established 12 years earlier. These are just some examples of Mary’s once-flourishing entrepreneurship. Today, the people of Mary are struggling to survive. Trade remains the main source of income for the population, but profits have grown thinner and people are left without money. The food and economic crisis has reached the region once known as the country’s southern breadbasket. Mary residents stand in line from sunrise every morning just to get two loaves of bread. Two is the limit. Locals say this was unheard of even during the early years of Niyazov’s rule. “We get to the state-owned shop at 6 a.m. and buy a loaf for 0.50 manats. In private stores, a loaf could cost up to 2 manats,” Guvanch, a man who looked about 60, said. One manat is worth about five U.S. cents according to the real market rate. Guvanch means “pride” in Turkmen, but Guvanch was feeling anything but proud as he accompanied me around the city center. “Every morning, people line up outside the state-owned shops – old men, young people, even women. They’re all carrying empty water and soda bottles. These shops sell them cheap wine – however much they’ve earned, between 1 and 3 manats’ worth. They drink to get rid of their headache and stress and then go off to do their work – collecting empty glass and plastic bottles. This is one of the places they hand them in,” he said, pointing to an ordinary garage. The door to the garage was wide open. 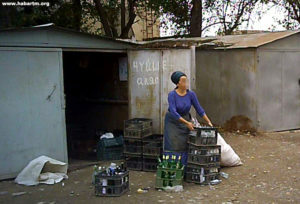 A woman had been receiving and sorting the bottles since early morning. 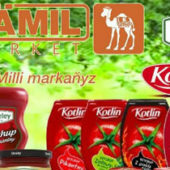 “The long-neck vodka bottles go for 0.30 manats, the short-neck ones and smaller bottles sell for 0.20 manats,” she said. She pays out around 300 manats a day for the bottles and makes between 20 and 30 manats in profit. This woman alone buys between 1,000 and 1,500 vodka bottles a day. A similar reception point is operating in another garage around the corner, where young men are energetically putting bottles into crates. Public sector workers are desperate to hang on to their jobs and will agree to whatever the bosses want, as there’s no other work. Do I need to pick cotton or cheer at a state event? No problem! People agree to anything. Their salaries are minimal. A store salesman gets 500 manats per month. 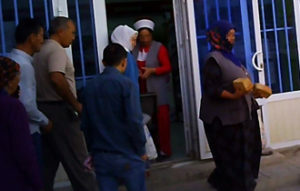 A kindergarten teacher earns 900 manats. How can you live on $25 or $45 at today’s prices? Guvanch worked his entire life at the Mary Machine-Building Plant, which produced electric pumps for the oil industry. Around 30 years ago in the Soviet era the plant produced 250-300 units a year, and then had plenty of orders from the CIS states. The plant has been failing for the past five to seven years. Equipment had not been upgraded for decades and became so outdated that production came to a standstill. There was a row over the last orders that came from Kazakhstan and Belarus in 2015 and 2016. The customers said they had been supplied with faulty units but couldn’t send them back, while the plant said they had sent working pumps. There’s no export market for the pumps any more; Russia, for example, has raised its technical standards and the Mary plant cannot keep up. Guvanch and dozens of his colleagues were left without work, as orders dwindled to occasional minor repair jobs. After I left Guvanch, I stopped by a state-owned butcher. Inside the shop, a large poster showed a delicious meat platter, but the refrigerator beneath it was empty. “Excuse me, where’s the meat?” I asked. “There’ll be some tomorrow,” the shopkeeper said. My question had given me away as an out-of-towner, because all the locals know there’s no meat for sale at state prices. 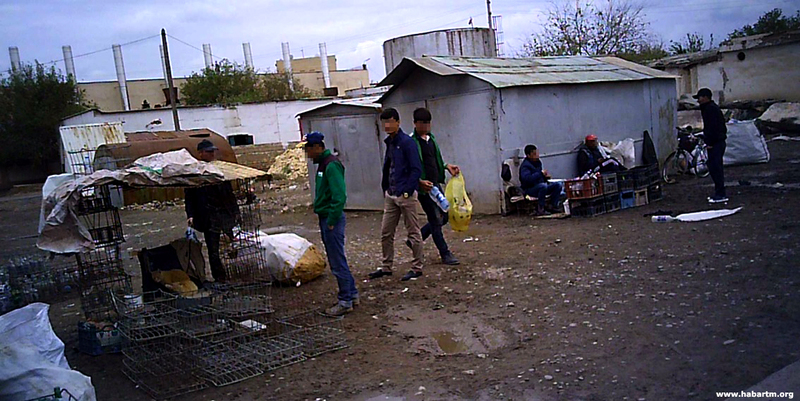 But he did have plenty of eggs, a rarity in Turkmenistan, for sale at the market price of 0.6 manats. People in Mary, once the richest region in the country, prefer to stand in line for hours to buy the eggs at half the price. She bought a few eggs and got back into a white SUV, leaving a trace of perfume in her wake. The stratification of Turkmenistan’s society is there for all to see. Some people drive expensive cars, carelessly shop for expensive goods at market prices, spend their weekends in Dubai or Thailand and post their escapades on social media. They go to shops that are stocked to the rafters but with goods at market prices. The huge supermarket Belent is one of these shops. Inside it seems as if the food crisis really does exist only on the Internet. The few shoppers in the supermarket are mainly standing in line for cakes and other confectionery products, baked on the premises. 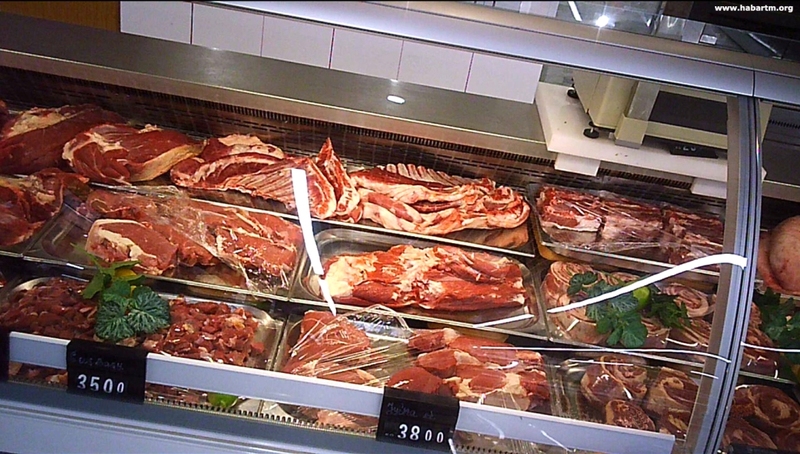 There’s every kind of meat and cut on display, but it’s not cheap. A kilogram of fillet steak is 38 manats; chicken legs are 21 manats; a kilo of sausage is 37 manats. With his monthly salary a lathe operator like Guvanch could afford 19 kilograms of sausage, plus a couple of kilograms of meatless bones, not that Guvanch could do that now. It’s unlikely that Belent’s employees can afford to shop there either. 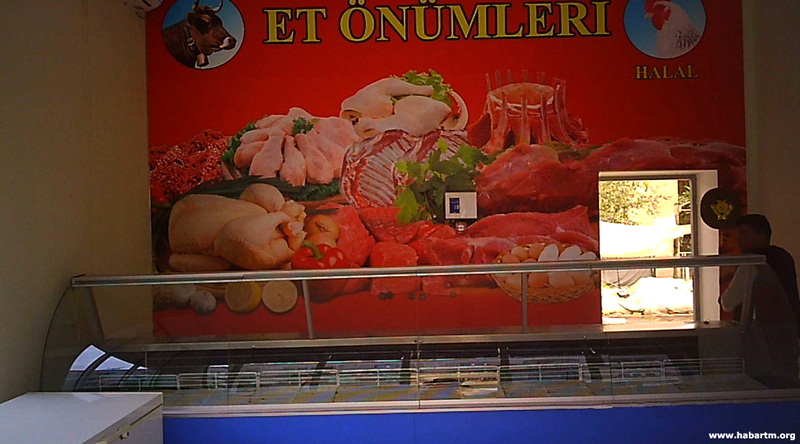 At the bazaar, beef sells for 30 to 32 manats per kilogram, pork for 40 manats. But the traders struggle to find buyers and they sit around playing backgammon or checking their phones. Ordinary people cannot afford these prices for meat. Instead, they stand in line for bread first, then they move straight to the chicken legs line. Sellers pack two pieces of frozen chicken legs into a bag and sell it for 8 manats per kilogram. Then they force customers to buy some expired packets of chips, crackers or stale chocolate left over from New Year. 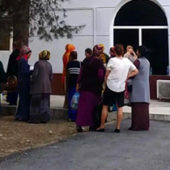 The next long line is for sugar, which is sold at the state price of 7 manats per kilogram, but each buyer is allowed only 2 kilograms. There’s no shortage of sugar at the bazaar but it costs 9.50 manats, which is too expensive for many. 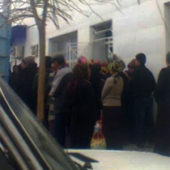 Then there are the lines at the ATMs to withdraw pensions, salaries or benefits. This is what everyday life looks like in the “Epoch of Might and Happiness” in Turkmenistan. P.S. : People in Mary seldom speak about politics for obvious reasons. Yet, everyone is aware that something must be wrong in a country so rich in hydrocarbons, cotton and other raw materials and with a small population. The crisis in the city and the region is real, despite state TV’s propaganda of plentiful shelves of food and happy citizens thanking the president for creating paradise. Everyone knows they are living in a parallel world, trying to get to the front of the line.